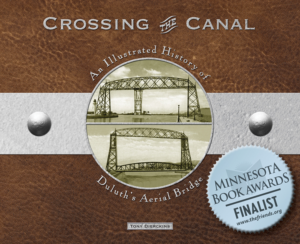 The operation of Duluth’s aerial transfer bridge was surprisingly simple. The gondola car was suspended from the lower rail of the bridge’s truss by a stiff-riveted steel hanger. At the top of this hanger was a “traveling pulley”—a truck holding many sets of wheels that sat in a groove along the truss. A one-inch steel cable wound through this traveling pulley and down to a large drum mounted on the side of the gondola car and back up. Two fifty horse-power electric streetcar motors installed beneath the ferry turned the drum, making the cables wind around it and up to the traveling pulley, setting the car in motion. Only one motor would operate at a time; the other was reserved as a backup. If the electric motors failed for any reason, operators could use a hand gear to move the car safely to shore and out of the way of oncoming vessels.